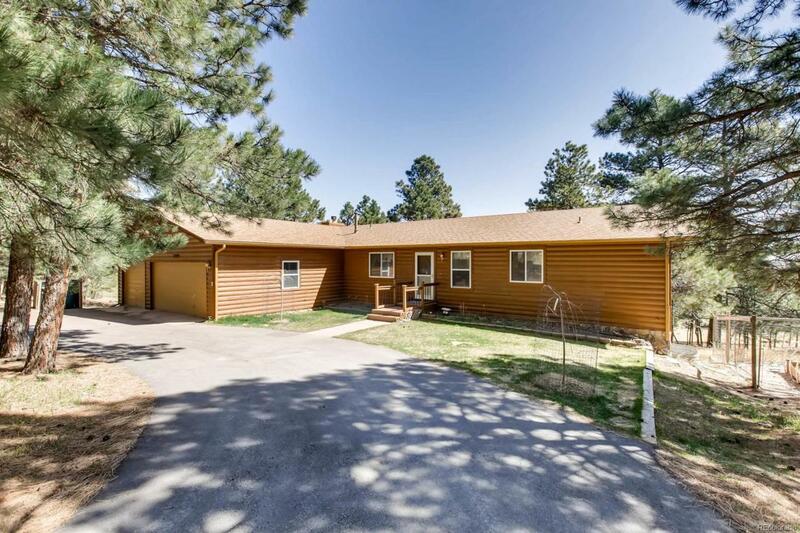 Sprawling immaculate ranch nested in beautiful Ponderosa Pine trees in prestigious Peyton Pines where you can enjoy trees, wildlife and quiet yet still a short drive to town. Lovely log sided home situated on 5 treed acres, has a large great room open to the massive kitchen where you can entertain in front of a stone-clad fireplace and enjoy spectacular views. There is plenty of counter & cabinet space in the large country kitchen with a huge breakfast overlooking the gleaming hardwood floors of the great room. The massive master retreat with its attached 5-piece master bath also has hardwood flooring and looks on to the beautiful scenery complete with a fenced in garden. Enjoy the outdoor living on the huge wood deck while gazing at rolling hills and pine trees. The giant walk-out basement has 3 more jumbo sized bedrooms, a huge recreation room and a beautifully remodeled bath. Easy commute distance to both Colorado Springs & Denver, this is the perfect place to enjoy Colorado living.